What black magic is involved with posting pictures? Edited because it should say "Hey Jen... not "Hay Jen..."
Last edited by 1006587; November 22, 2003 at 17:55. Do I need to post a link to something like photopoint or something else. I am really a novice to this digital camera. Thread on this in the FAQ. "The Spartans do not enquire how many enemy there are. The Spartans merely enquire WHERE they are." How do you post pictures? Is there a how to section that gives us instructions on posting, moving one's post to another forum, posting pictures, using smiles, etc. Hell, I can't be over the hill,I haven't reached the top yet. 1. Host the photos on a website or a free hosting service. From there you can use the [ img ] and [ /img ] tags (just stick the exact URL for the image in between those two tags with no spaces and make sure you remove the spaces in the tags as well) to show the picture. Just make sure the URL you use brings up nothing but the image. If it brings up a web page then it won't show. 2. Use the attach file option to attach your image directly from your computer to our server. The file needs to be a .gif or .jpg file and has to be under 102400 bites in size. You don't know me, son. So let me explain this to you once: If I ever kill you, you'll be awake, you'll be facing me, and you'll be armed. Wann post a pic, but can't seem to, has the site changed? Wes, only contributors/moderators can post pics or polls now. Jen changed it a couple weeks or so ago due to bandwidth issues. HELP! -has posting a pic format changed in the past few wks? Can anyone assist me here. Wes- 'attachments' require you to be a Contributor. You may still link to a hosted pic. If you have needs, e-mail me a pic and I'll hlp out. For some darned reason, I cannot attach pics unless I use a third party host. It just ignores them, and I am forced to use Printroom and Hunting-Pics - whom absolutely trash the resolution. Either I am retarded [a possibility], or there is some some sort of bad mojo in the ether for ol' Gaspipe. Maybe you can if you are a contributor? "Who ever said that Common Sense was so Common?" hmm.... not sure what the problem is. Try again here to post something like one of the FAL logos at the top of the page inside the IMG tags and see if that works. Attaching file via 102.4k button no workee? gas: are you getting any message or is it just not posting the image? No messages, it just seems to ignore the image. I'm having the same problem in REVIEWS, and it is because of the Moderation issue. I had thought maybe it was just some forums after I read your post, but I can't attach a pic in any forum, not even the Images one. I just went and d/l'd myself an FTP program and will use my gazillion Mb's of webspace at work. How axactly do i post a pic? If you are not a contributor to the Files, you need to have your picture hosted on the Internet. Be sure to note/copy the URL for the uploaded picture. 2. Open either a Post New Thread or Post Reply window. 5. Click OK and the image 'coding' will be inserted into your post. NB: You can check how the graphic looks by clicking the Preview button below the posting window. 6. When the post is ready, click the Submit button below the posting window. If you are a contributor to the Files, you can upload a picture/file with your post. 1. Make sure the file you want to upload is of the right size (102400 bytes max), and type (valid file extensions are gif jpg png txt zip bmp jpeg). NB: You can use MS Photo Editor to edit a picture. Search for 'photoed.exe' on your computer. 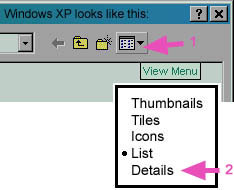 (On my WinXP, Home edition, MS Photo Editor is found in: C:\Program Files\Common Files\Microsoft Shared\PhotoEd, but the app needs to be chosen by using the 'custom installation' choice for XP -- the normal installation does not load it.) Also, many people like to use IrfanView. Please see Post #49 on the next page. 3. First type in the text you want to have with the picture (the picture will be added at the end of the post and you can only add one picture per post). NB: When the text is ready, click the Preview button below the posting window to make sure the text is as you want it. Once you enter the file name to be added (instructions following) and you click the Preview button again, the file name to be uploaded disappears from the 'Attach file:' field and must be reentered. 5. A Choose file window will open. 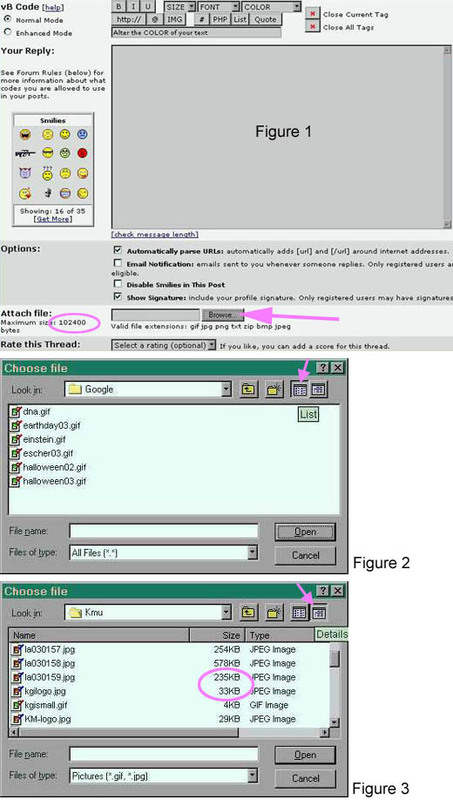 NNB: If you are using Netscape instead of IE, the window will be called 'File Upload' instead of 'Choose file'. 7. Select/highlight the file you wish to upload to the Files. 8. Click the Open button. 9. Click the Submit button just below the posting window and your post should contain the picture/file you wanted to upload. NB: Remember that if you click the Preview button, the file name will disappear from the input field and will need to be reentered. "what's right isn't always popular, and what's popular isn't always right." Last edited by Trixie; December 12, 2008 at 09:58. Falophile- any chance of getting an FTP so we could upload our own? Just curious. Maybe give me access to my own folder or something. I looked at everything in search, etc, but I still don't know. I am a contributor, but when I use the attach picture feature, nothing posts, I am just taking them from "my pictures" on my computer. Any suggestions about what I am doing wrong? In English? Pics cannot exceed 102400 bytes in size. Resample/resize to an acceptable size. Remember JPG files autocompress and decompress, so the stored size is what matters. Make sure you 'BROWSE' to capture the pic from the folder, and VOILA! in knowledge and savings on the group buys.. Thanks Para Driver. I just registerd yesterday. I'll send Jen $10 in your name, so you can enjoy contributor status.. I know this has probably been done to death, but I can't find a good description through the search function. I've tried posting photos lately, and have posted them in the past. Apparently I'm doing something wrong though. I go to images, hit "post new topic," type in the text and subject, hit the browse button and open the file from "My documents," which conatins the photo, then submit thread. I've checked the image size, and I'm a contributor. What am I missing? Kind of a slow day so I have been browsing various photo sites and picked out 2 interesting (to me) photos to share on the board. The first time I posted I mistakenly attached the wrong photo to my text so I went back in using edit and deleted that post. I then re-posted using the correct photo. Now, when I try to post the other photo with my correct text I get the message that I have already posted that photo before and for me to avoid posting the same photo twice. I changed the name on my photo and it still won't let me post it, even if I go to a different forum. No big deal, I guess. The world will not come to an end if I don't get my photo posted but I just thought the problem was curious. Anything worth shooting is worth shooting twice. The Files remembers picture sources and data, and cares little about the name. So resize the photo a bit, or trim it to get rid of superfluous staff. Prevents 'stacking' the Files by aberrant DOS hackers. How I could post pictures before and now I can't? Has freedom been replaced with Free-Dumb. A 1911A1 is like a Glock, except it's for grownups. "The Marines I have seen around the world have the cleanest bodies, the filthiest minds, the highest morale, and the lowest morals of any group of animals I have ever seen." Thank God for the United States Marine Corps!" Flying is a hard way to earn an easy living. Hs your Contributor status expired? you can check at your 'user cp' above: it'll show your Contribution dates and therefore whether or not your're active. I probably posted a 100 pictuers in the past few years. Now i'm unable. Odd. I'll get Jen to work on it: she IS the webmistress extraordinaire. PS- I use XP sans problemes. pix attached using the browse button, shows the file, but when I preview, no pix. I sent in a contribution on 10-12-03. When can I expect my picture posting privledges to be unlocked? For additional information, you can go to the Reference and Data Section's Eureka! All the FAQs of the R&D Forum, at your disposal thread and click on the Photos & Pics: How, Where, Who... link. You're not hosted. Since you're a Contributor, use the ATTACH FILE function, not the IMG button. I cannot find the photoed.exe file on windows XP. How do I reduce the photos to a smaller size to fit? I use a program called Irfanview to resize my pictures. It is a free program that can be downloaded at their site http://www.irfanview.com/ . Here is a short tutorial that I prepared for another user a while back. Hope this helps. 99.9% of image editing needs can be done using the instructions below. Play with the other options under the "Images" menu as time allows. They are not neccesary but are sometimes fun to play with. Last edited by Rooster; July 28, 2004 at 16:14.